Sheetlet mounted on souvenir panel signed by Dr. William R. Hanson, designer of the stamps and accompanying material, and Sailas Andrke, Postmaster of the Marshalls at the time. Descriptive text on the back of the card is reproduced below. Stevenson's visit to Apemama, Gilbert Is. 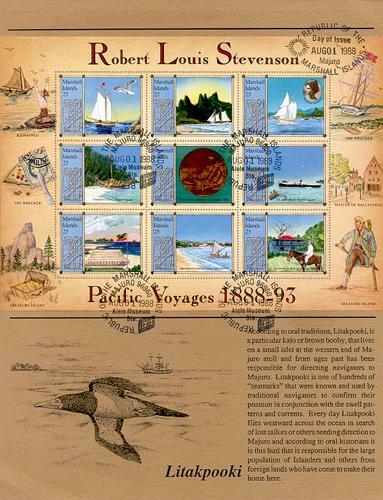 This stamp issue presents a pictorial guide to Robert Louis Stevenson's self-imposed exile to the Pacific from 1888-1893. 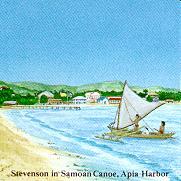 During that series of cruises that brought him to most island groups in the Pacific, Stevenson ventured aboard the S.S. Janet Nicoll in 1890 to the Marshall Islands. Struck by the Islands' serene beauty, he visited Majuro (describing the atoll as the "Pearl Necklace of the Pacific"), Jaluit, Namorik and Ebon. While there the great King Kabua, ruler of the Marshalls, presented Stevenson with a stick chart, one of the few showing the entire chain. This stick chart, which is now in the collection of the University Museum of the University of Pennsylvania, is the common design element of each stamp in the sheetlet; and each stamp is framed by sticks bound at the corners with sennit, as in the chart. Marshallese navigators were famous of their knowledge of the sea, and used these unique stick charts as maps of the ocean currents among the islands. The Stevenson party was equipped with several cameras and documented their voyages with photographs. 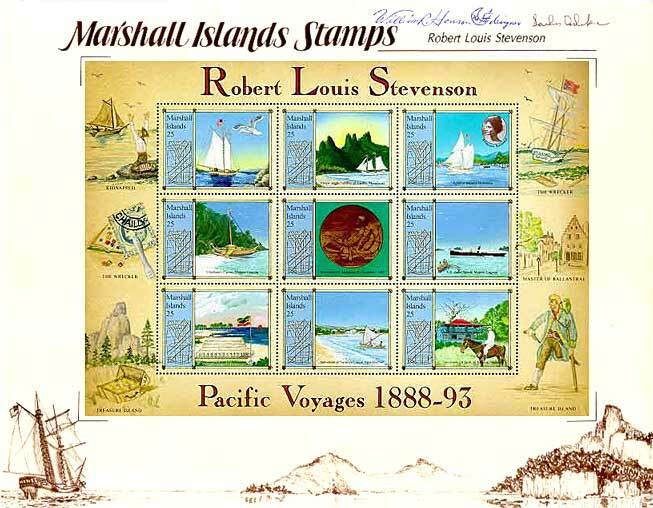 Designer William R. Hanson based most of the paintings of this issue on surviving Stevenson photos; the portrait of Princess Kaiulani in the third stamp is an actual Robert Louis Stevenson photograph of 1889 taken during his visit to Hawaii. 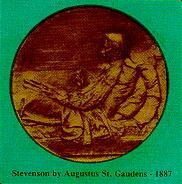 Following the prime axiom for successful writing, "Write about what you know," even for works of fantasy, Stevenson enriched his novels with images from his own personal experiences: the coastal villages and sailing ships in Treasure Island came from his travels with his father, who was Britain's chief lighthouse engineer; the Scottish castles and highlands of his youth are in Kidnapped; his visits to Albany and the Adirondack Mountains of New York evoked images in Master of Ballantrae; and his Pacific voyage experiences formed the basis for The Wrecker, The Beach of Falesa, and Letters from Samoa. The sheetlet borders, simulating the aged parchment map of Stevenson's Treasure Island, depict scenes from his popular works rendered in the muted colors of old map decorations. Suffering from tuberculosis, Stevenson fled Scotland in search of life-sustaining climate  to the Riviera, to Saranac Lake in the mountains of New York, to a miner's cabin in the gold fields of California, through the many islands of the Pacific, and finally to Samoa. While in New York City in 1887 and 1888 he posed several times for the great American sculptor Augustus Saint-Gaudens, with whom he became fast friend and carried on a steady correspondence until his death in 1894. The center stamp reproduces the bronze portrait relief (now in the Tate Gallery, London) modeled by Saint-Gaudens in the familiar position Stevenson took for these sittings: writing while propped up in bed with pillows, a raft of papers in one hand and his invariable cigarettes in the other. 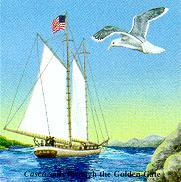 The Stevenson party embarked aboard the chartered schooner-yacht Casco in 1888, sailing through San Francisco's Golden Gate to chase the setting sun. 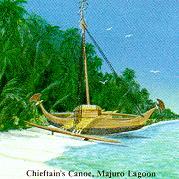 First land-fall was Naku-Hiva in the Marquesas, which Stevenson described: "The first experience can never be repeated. The first love, the first sunrise, the first South Sea island, are memories apart and touched a virginity of sense .... the first rays of the sun displayed the Needles of Ua-pu. These pricked about the line of the horizon; like the pinnacles of some ornate and monstrous church they stood there, in the sparkling brightness of the morning, the fit signboard of a world of wonders." 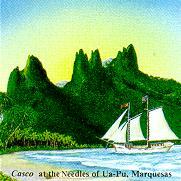 In the village of Tautira, Tahiti, the Stevensons spent months as guests of Chief Ori, while the Casco went back to Papeete to have her dryrotted masts repaired. It was time well spent, for here Louis made great advances in The Master of Ballantrae and Song of Rahero. In Hawaii the Stevensons were accepted as virtual family by King David Kalakaua, his sister Princess (later Queen) Liliuokalani, and the beautiful Princess Kaiulani. Between drinking bouts with Kalakaua, Louis found time to visit Father Damien's leper colony on Molokai and play croquet with the children (to whom he later sent a piano from Honolulu), and finish The Master of Ballantrae. 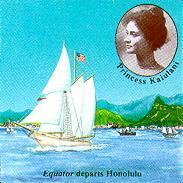 The poem he wrote in Princess Kaiulani's autograph book is still memorized by Hawaiian children today: "Forth from her land to mine she goes, The island maid, the island rose.." When the Stevensons departed Honolulu in their schooner Equator in June 1889, a carriage bearing the King, followed by one with the royal band, galloped up to the dock so the King could wish his friends good-bye with a champagne toast and a serenade. In the Gilbert Islands Stevenson saw life on "the Beach," with the hair off. Much of The Beach of Falesa is based on actual events he witnessed at Butaritari during a particularly exuberant 4th of July celebration. When the Equator deposited the party next on Apemama, they found themselves guests of King Tembinoka, "the Napoleon of the Gilberts." 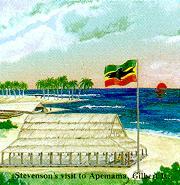 Tembinoka, who had previously excluded all Westerners, took a fancy to the Stevensons and spent many hours conferring with the white-suited author in the thatched Maniap depicted on the stamp. The tri-colored shark flag, which Mrs. Stevenson designed for Tembinoka, flies over their meeting. While waiting for the long-overdue Equator, Louis and his son-in-law Lloyd Osbourne collaborated on The Wrecker, using some of the crew as character models. The story revolves about the abandoned Flying Scud wreck at Midway; clues in a stamp collection are used to track down the missing crew and solve the mystery. In the sheetlet margin are two depictions of The Wrecker: at the top right is the Flying Scud wreck with her ensign inverted as a distress signal, her rescue ship seen steaming in the distance; in the middle of the left margin is the French stamp with the critical clue of the Chailly-en-Biere postmark. 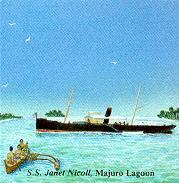 In December 1889 the Equator dropped anchor in Apia Harbor, Samoa. Stevenson didn't know it yet, but he had come home: within weeks the Stevensons had purchased 314.5 acres on the side of Mt. Vaea overlooking Apia Harbor, and arranged for a house (Vailima) to be built. 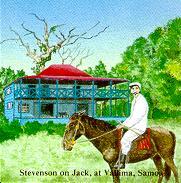 Stevenson enjoyed the best health of his life in Samoa. He often worked on the grounds of his plantation, rode his Samoan pony Jack to visit his Samoan friends (who named him "Tusitala," the Teller of Tales), and took great pleasure in all things Samoan. He was often seen in his white suit and nautical cap sailing in a native canoe, either in Apia Harbor, or coasting around Upolu Island. Samoa in 1889 was still an undivided independent kingdom, under the joint protection of America, Britain and Germany, as negotiated in Berlin earlier that year. Stevenson so embraced the warm-hearted Samoan people that he tried to use his influence to rid the government of corrupt Western influences, and he was almost expelled by the Tripartate commissioners. 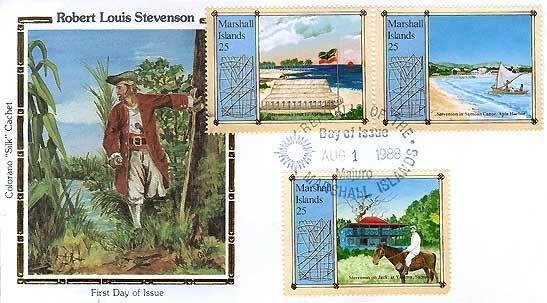 On December 3, 1894 Robert Louis Stevenson died at Vailima. The highest-ranking Samoan chiefs cut a path up the side of Mt. Vaea with their own hands and then carried his body to its gravesite. To this day, Stevenson is still remembered, with Melville and Michener, among the three best to record the real Pacific. Vailima is now the home of the Head of State of Western Samoa. 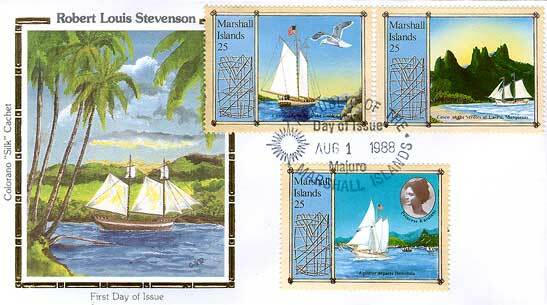 This special Stevenson tribute by the Republic of the Marshall Islands was researched and designed by William R. Hanson, who also designed the cachet for the official FDC and wrote and illustrated this panel. The sheetlet was printed by the by the House of Questa, London; the FDC by Bassano Printing, Little Ferry, NJ. 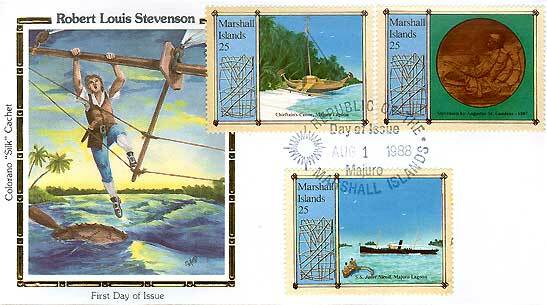 ©1988 by Marshall Islands Philatelic Bureau. Printed in U.S.A.